Happy weekend everyone! 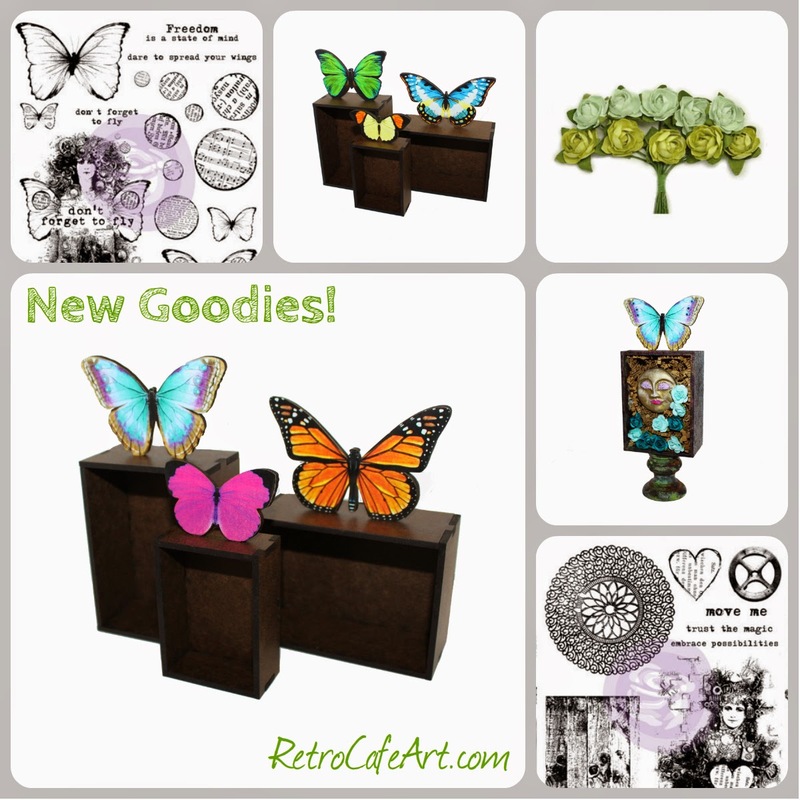 I'm absolutely IN LOVE with our new goodies this week. 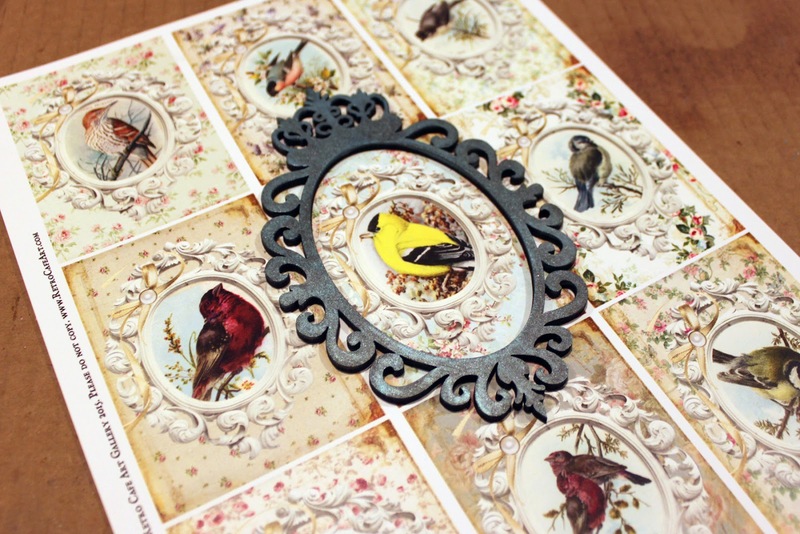 Gorgeous Victorian Frame Stand Ups, stunning new collage sheets, AND the Finnabair line is in stock and ready to ship. 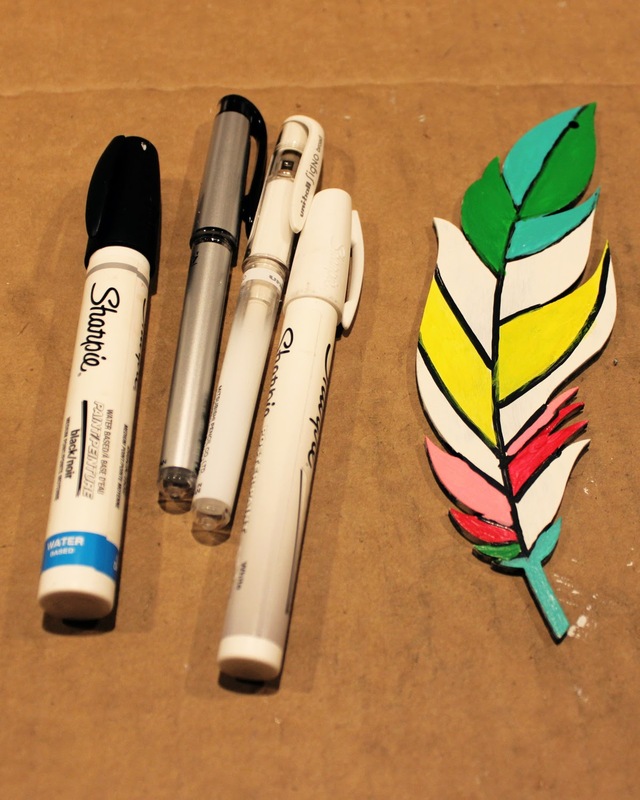 All of these goodies will go beautifully together! 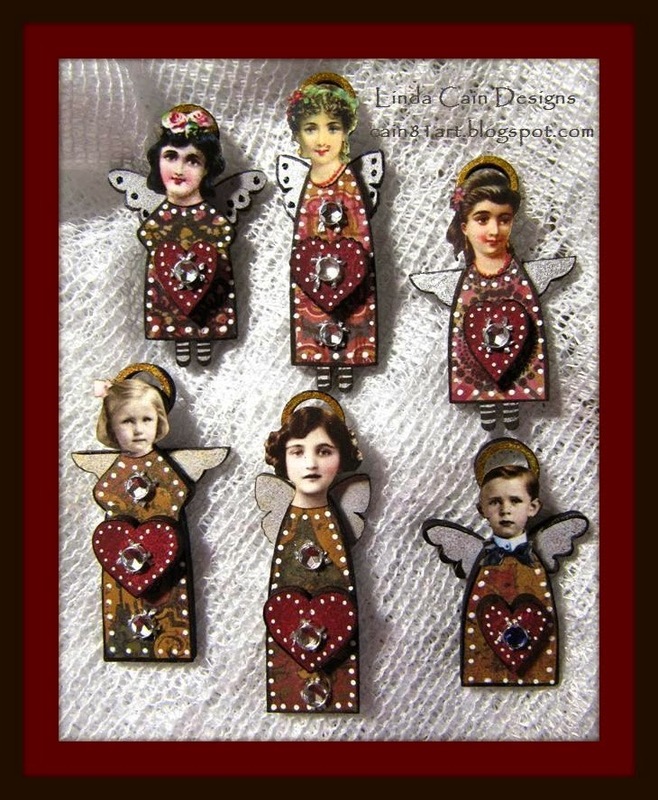 My favorite thing about the Victorian Frame Stand Ups is that they can be used for just about any holiday or theme! 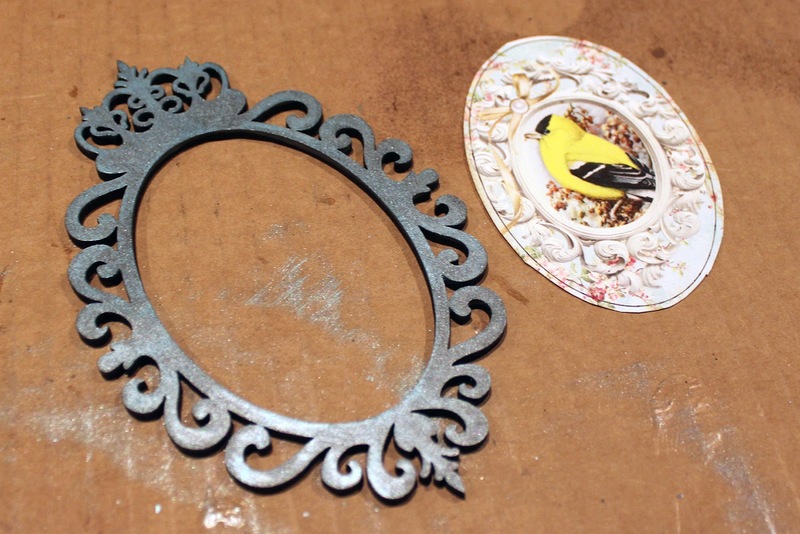 The idea came to me when I was packing orders and a Victorian Frame Ornament was sitting on a Butterfly Stick. And that was that! I just had to design some! And how can you resist the yummy goodies below! I can't wait to dive in! I had a blast playing with one of the new Victorian Frame Stand Ups. 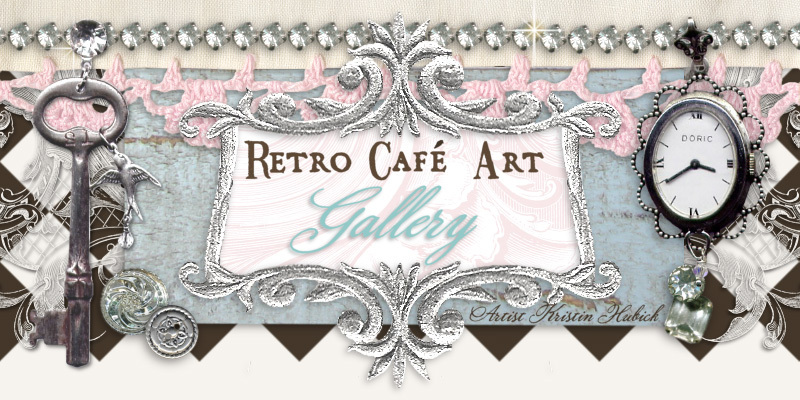 A few days ago while shopping I saw a gorgeous mixed media vintage bird painting, which was the inspiration for my piece. I adore the blues and yellows together. 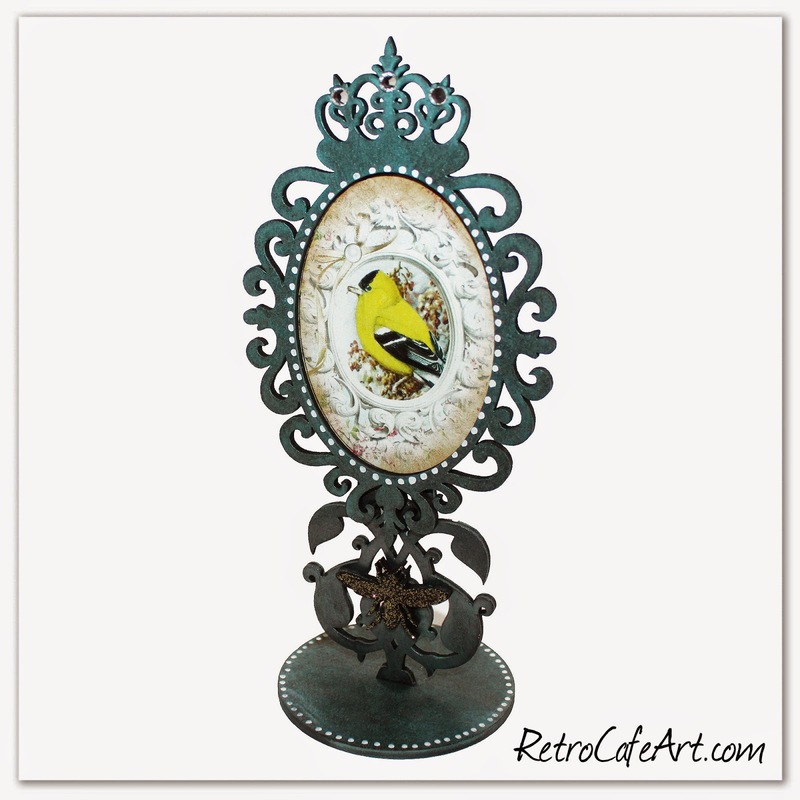 Supplie Used: Ornate Victorian Frame Stand Up Style 1, Bee Cut-Outs, Ornate Framed Birds Collage Sheet, Inka Gold Turquoise, Inka Gold Hematite, White Sharpie Paint Pen, Gold Stickles, Matte Glue N Seal, Sepia Archival Ink, Ink Blending Foam. 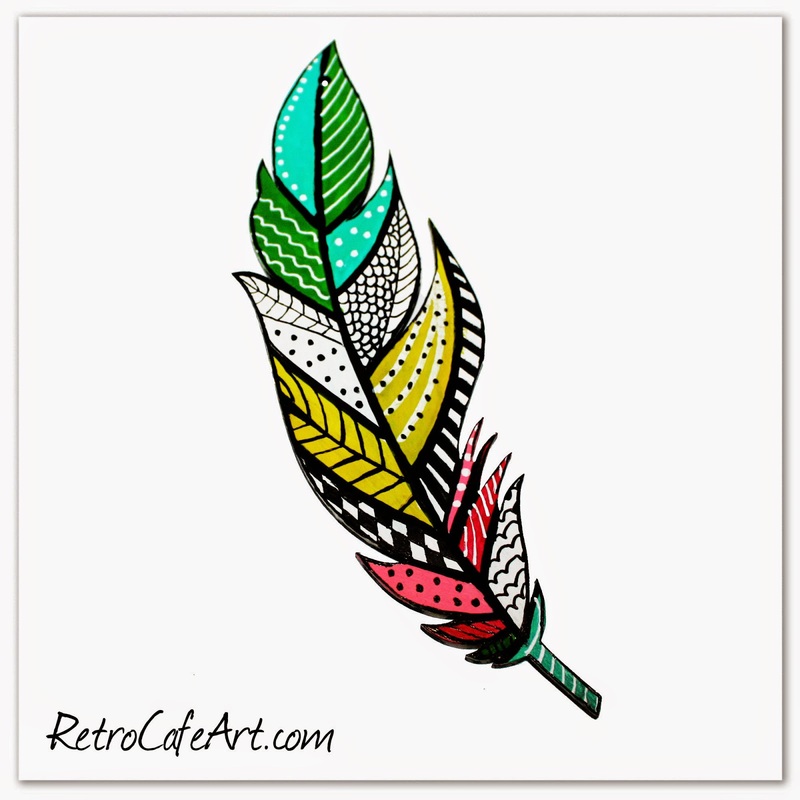 I would love to do a whole series with different birds! 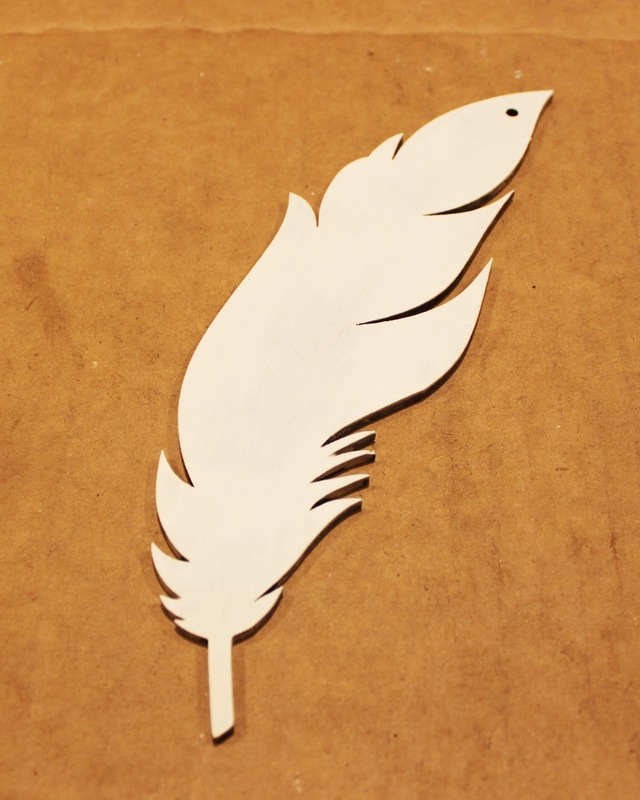 And of course the new Bird Collage Sheet I used would be perfect! I started by "painting" my raw masonite pieces with Inka Gold. I learned a great tip while doing this. Using my sponge brush and adding a bit of water now and then, the Inka Gold went on smooth as butter! 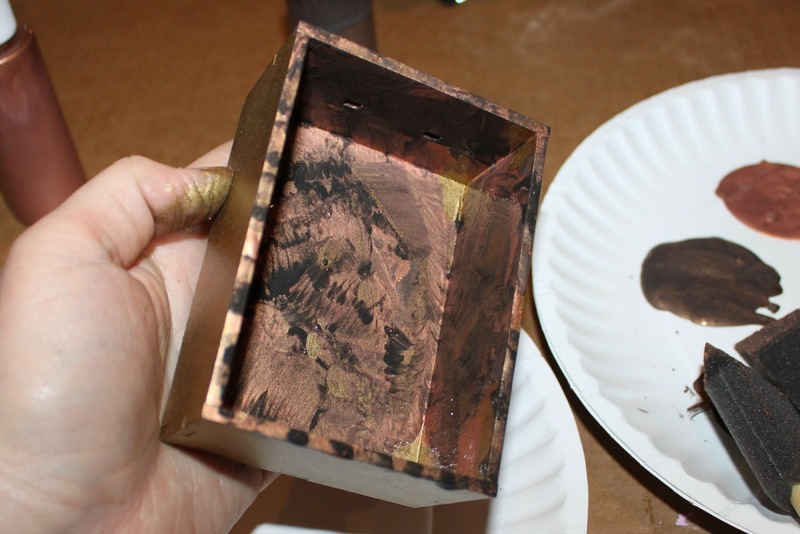 Often I use my finger to apply, and find the Inka Gold can flake off at times. The sponge brush/water method worked amazingly! It was SO FAST! And don't forget to store your Inka with a baby wipe to keep it moist! 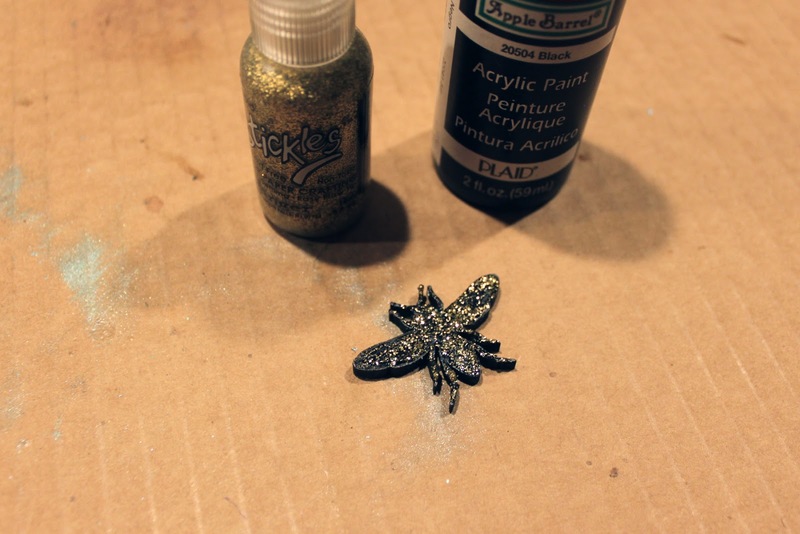 I added black acrylic paint and Gold Stickles to my Bee Cut Out. Cute little guy! 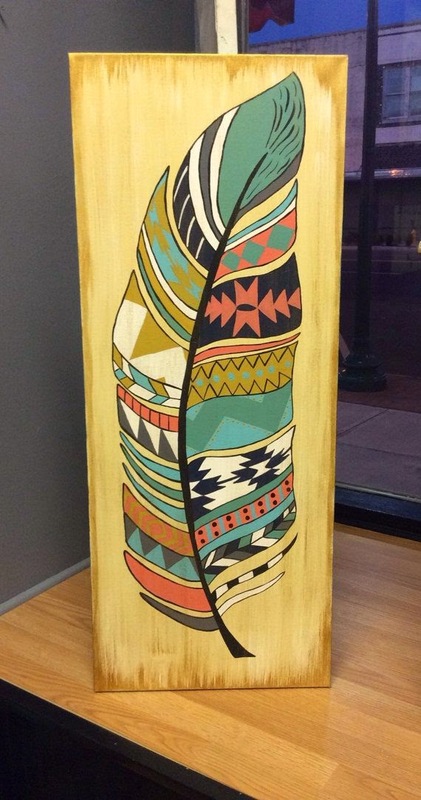 I'm calling my piece "Birds and the Bees". I positioned my frame on my Collage Sheet and drew a very thin line around the center. 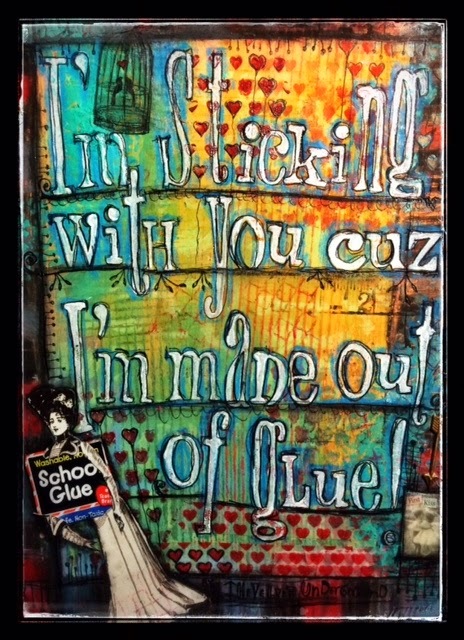 I cut out my Collage Image leaving a small border, and then glued the image to the back of the frame. Once dry, I attached the entire thing to my oval back. And then attached everything to the round base. I finished my piece with some White Sharpie dots and three small crystals on the crown. This piece was super fast and only took 20 minutes from start to finish including photographs. My new Inka Gold application had a lot to do with the speed. I love the way it came out! 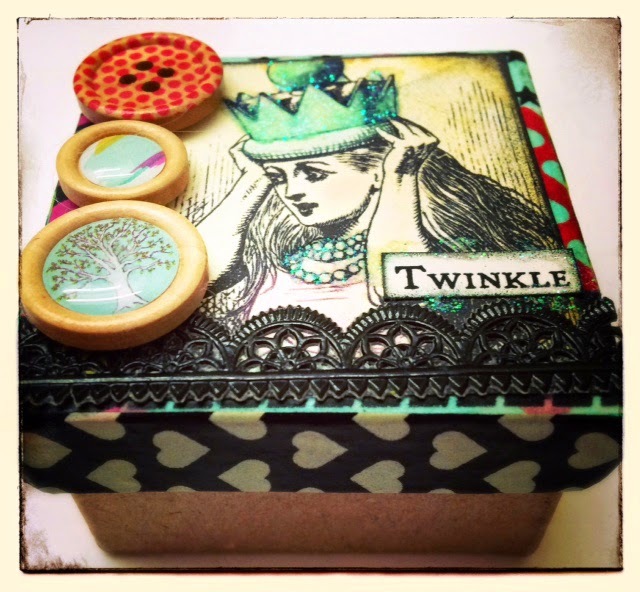 A super sweet trinket box by Design Team Member Amy Nieman using Collage Sheet DP322! 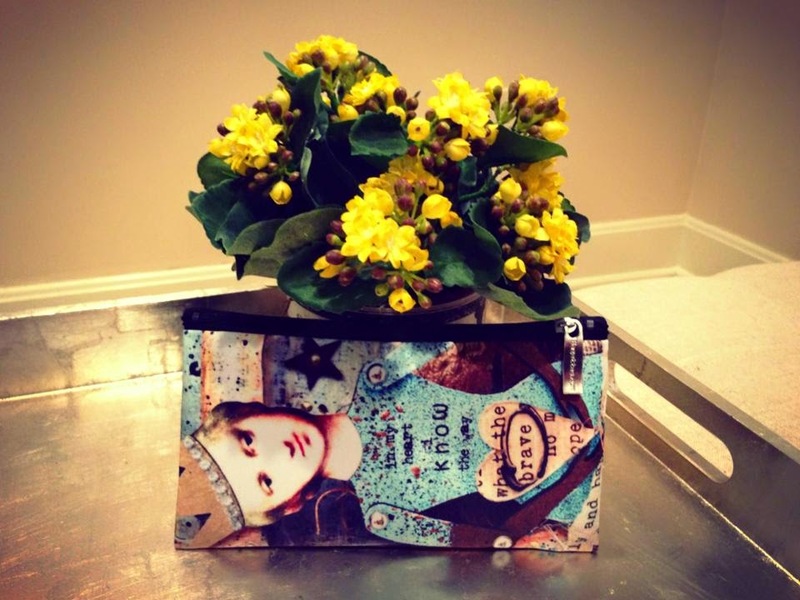 The perfect place for storing your tiny treasures! So cool Amy! 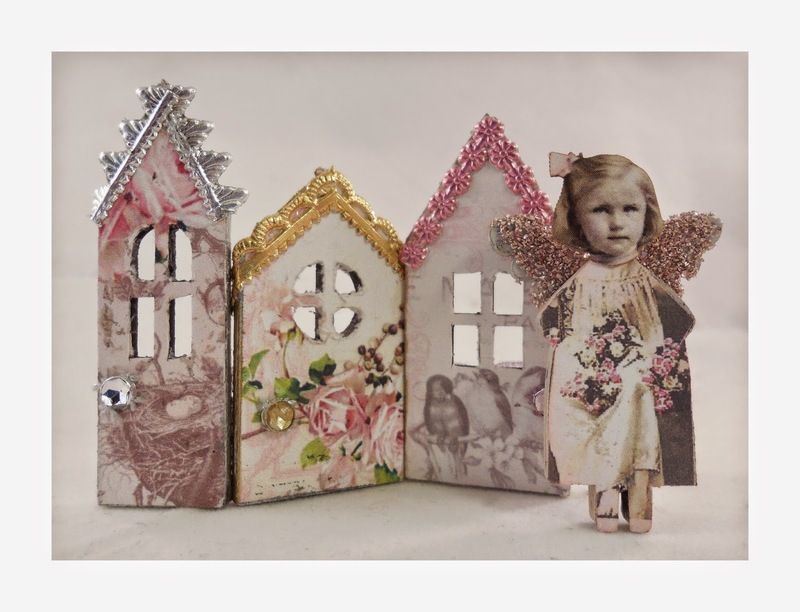 A sweet as can be tiny house assemblage by Design Team Member Lynn Stevens! 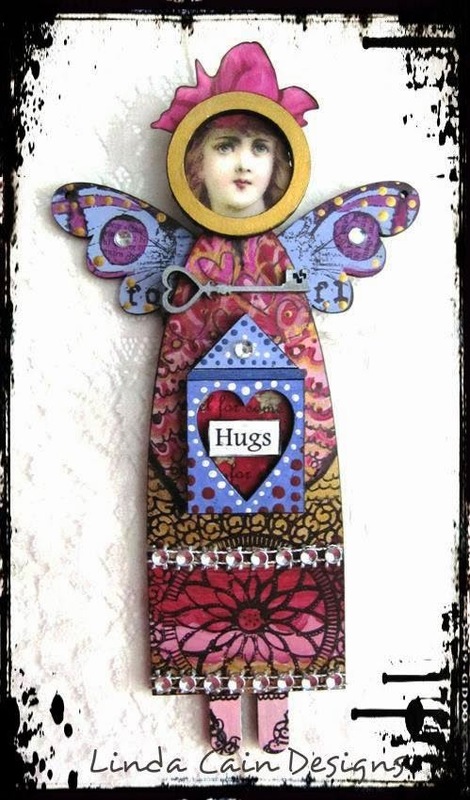 Love the Tiny Houses with the Tiny Angel! So clever Lynn! 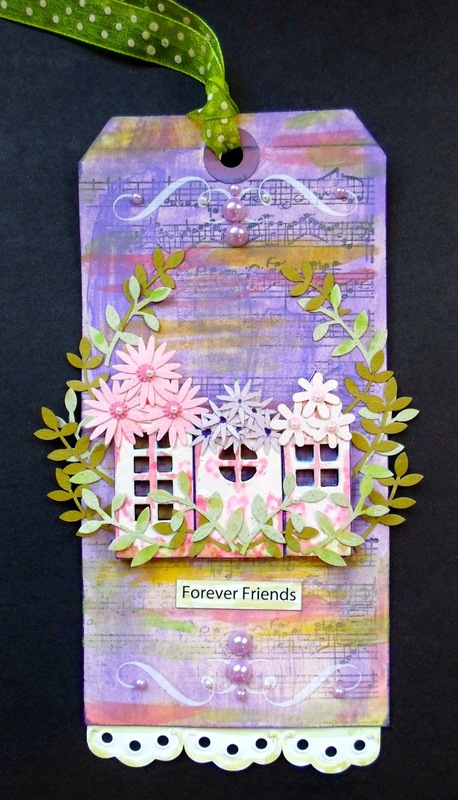 I'm loving this super creative ATC by Design Team Member Gerri Herbst! The tiny eggs in the chipboard nest are just too much! In the best possible way. Amazing composition Gerri! 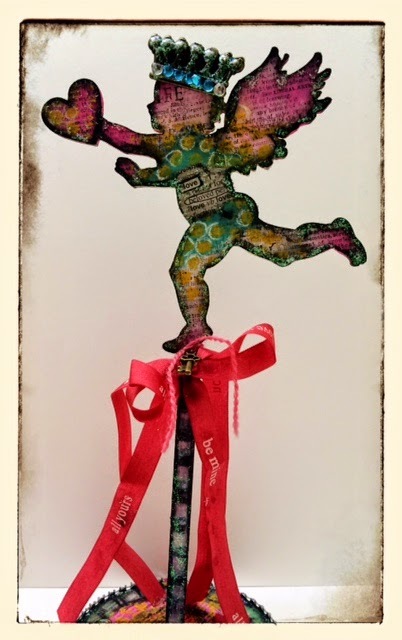 Trying to beckon Spring with this adorable Stand Up Fairy Bloom by Diana Darden! 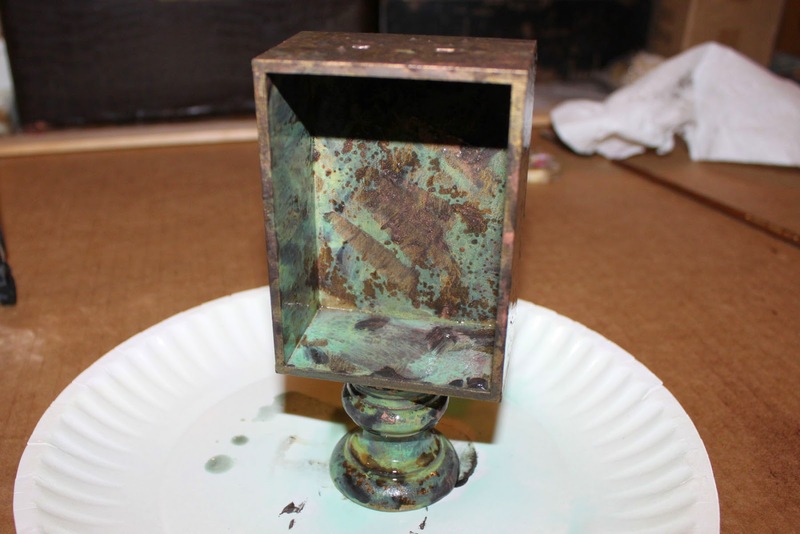 This may give you some inspiration for the new Victorian Frame Stand Ups! So sweet Diana! 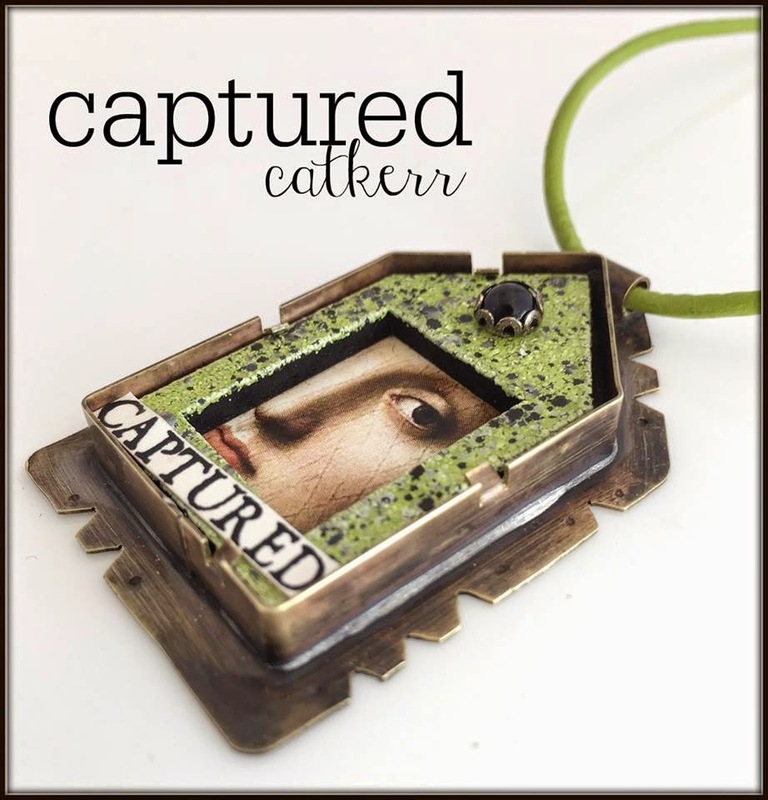 A huge congratulations to Design Team Member Linda Cain! 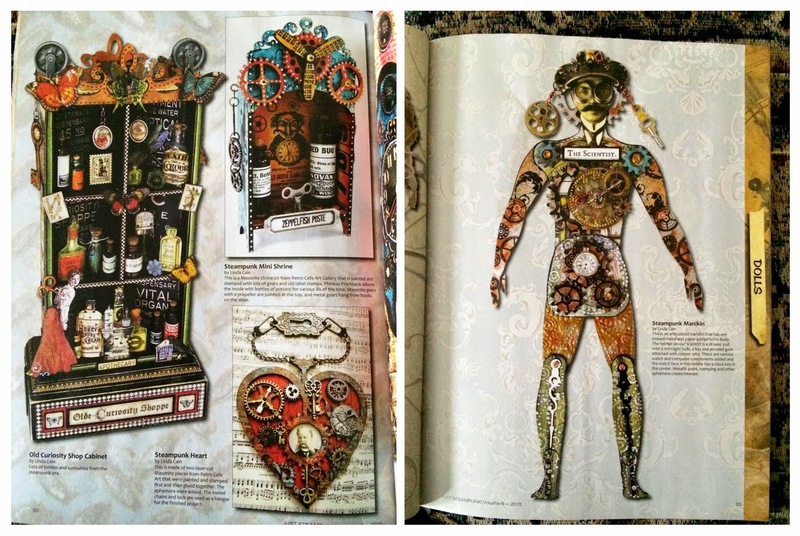 She has several of her art pieces published in the current issue of Just Steampunk Magazine (Vol. 6 on the newsstands now)! And because I knew you would ask, here are the links to her Design Team projects featured. Each one is even more fabulous! Way to go Linda! Happy weekend everyone! 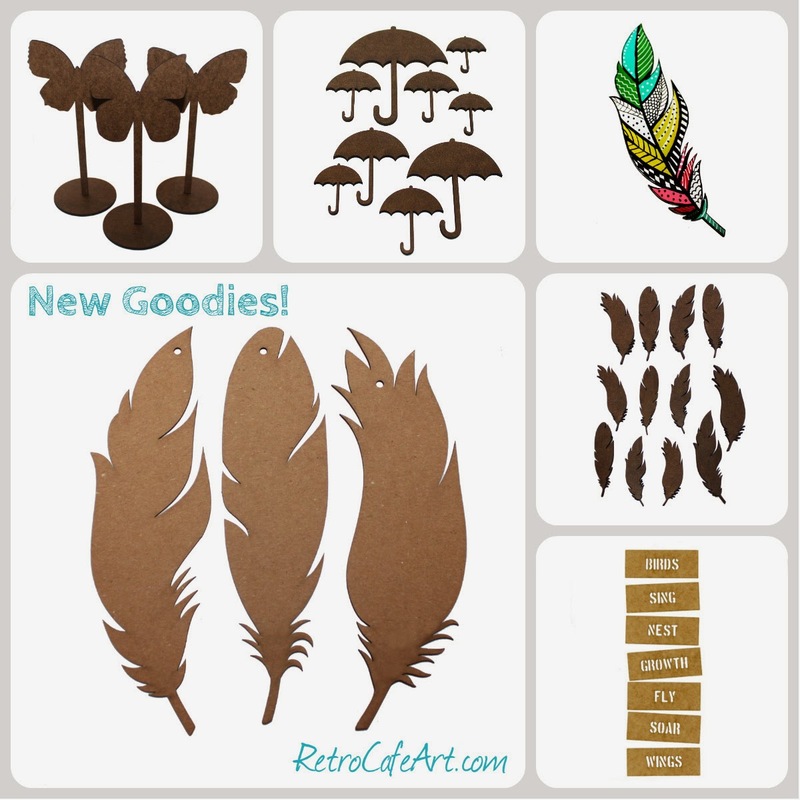 I'm so excited about our new goodies this week. 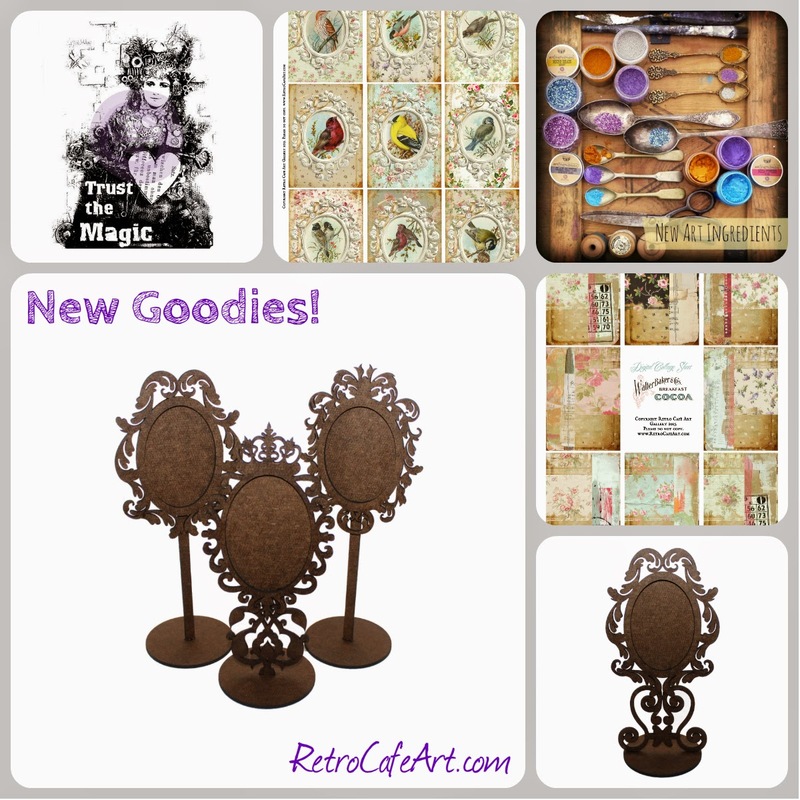 FABULOUS new Doll Kits with a wonderful vintage and Steampunk twist and tons of the brand new 2015 Tim Holtz goodies in stock and ready to ship! And it's all on SALE so grab it while you can! 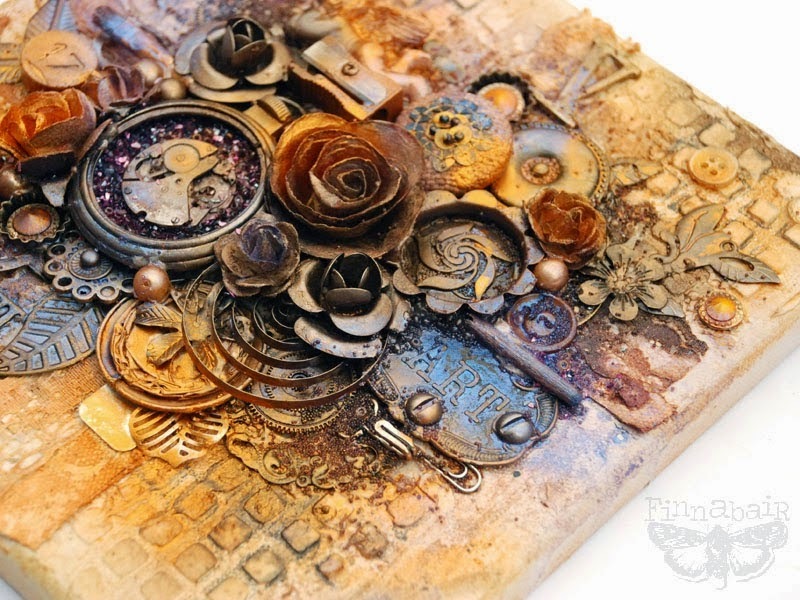 My heart skipped a little beat when I saw this stunning assemblage piece by Design Team Member Cat Kerr! I love how she creatively combined our Heart Shrine Kit and Stand Up Steampunk Cameo Woman to create this amazing (and large) piece! 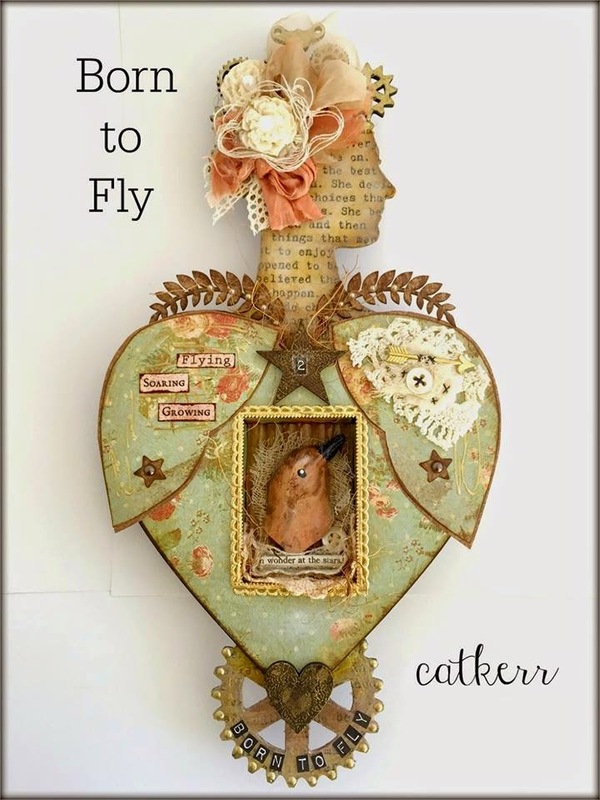 Cat has a full tutorial for you HERE on her blog with tons of photos and step-outs. She has the entire supply list linked as well. Amazing Cat! "I'm sticking with you cuz I'm made out of glue!" 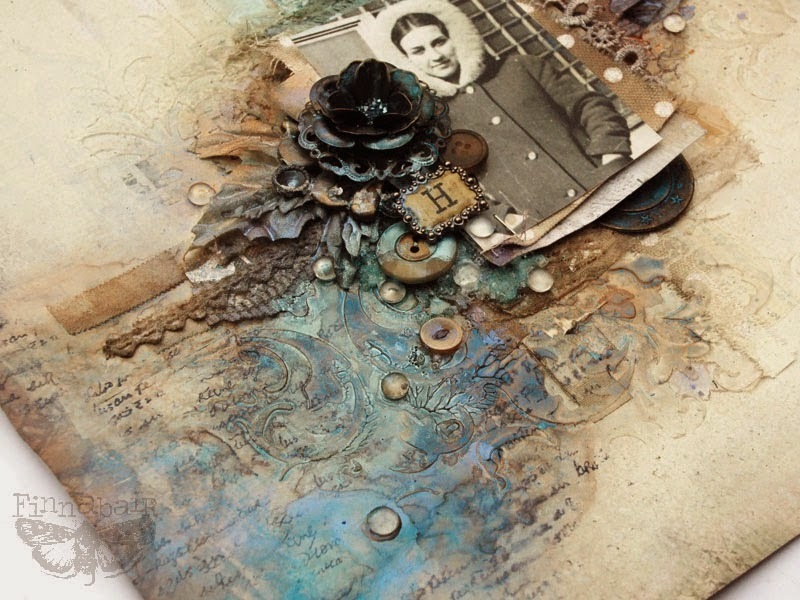 A gorgeous journal page Design Team Member Amy Nieman! I adore her lettering and of course the yummy Gelato colors! So gorgeous Amy! 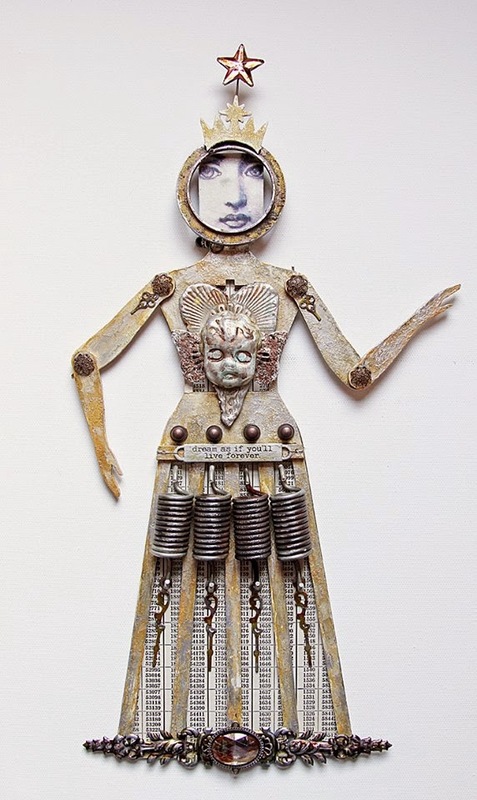 This absolutely stunning Santos Doll is by Tina Walker! 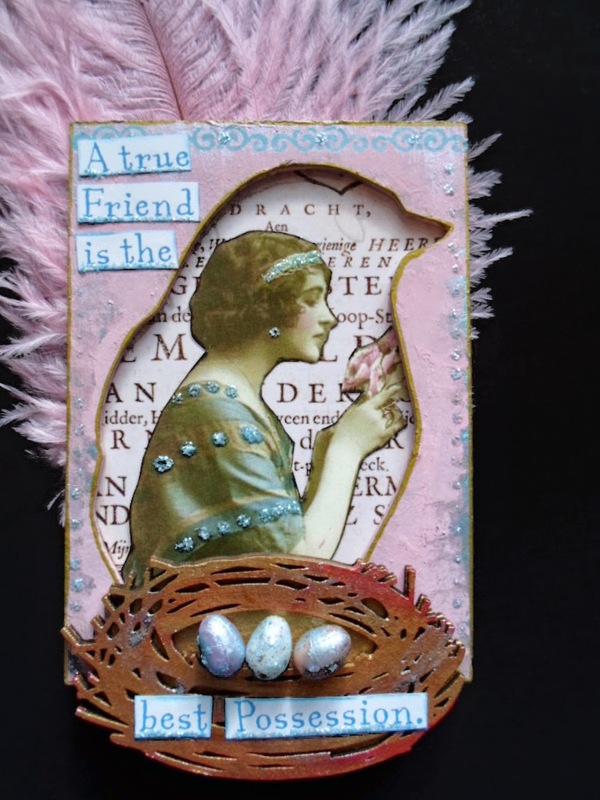 All of the assemblage bits are wonderful and very fitting for this week's release! Her molded center piece is amazing too. 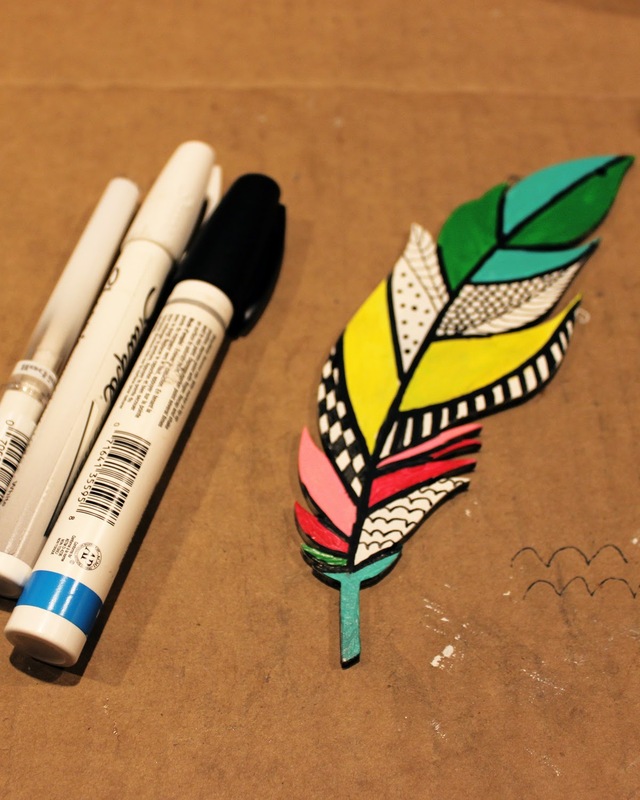 So creative and inspiring Tina! 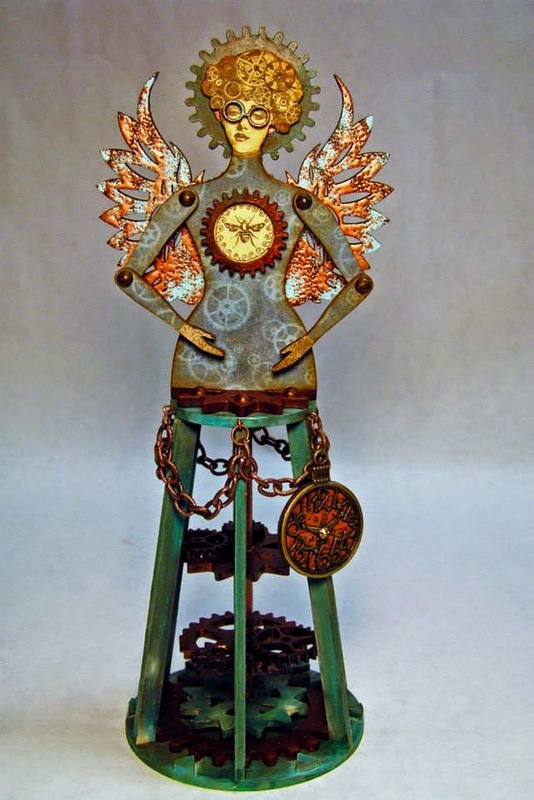 And last but definitely not least, an incredible 3D Santos Cage Doll by Lisa Rupp! Notice the "floating" gears inside the cage? My favorite part! And the amazing finish on the wings? So gorgeous Lisa! 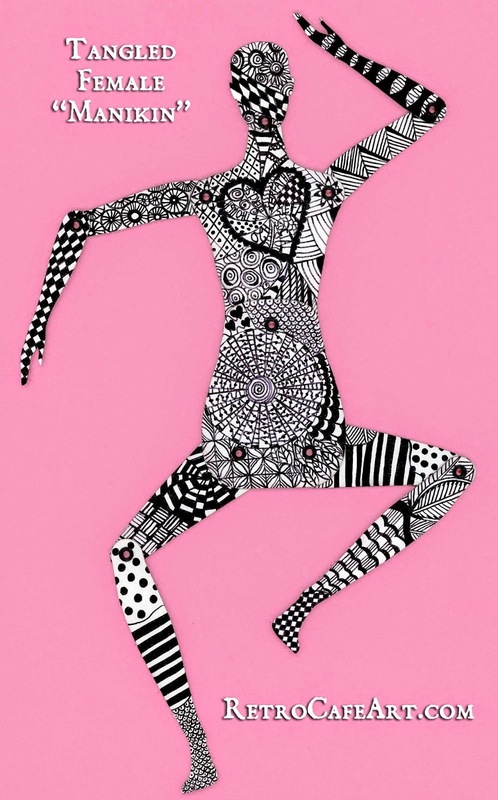 Now I'm definitely in the mood to play with the newest Doll Kits! Happy weekend everyone! 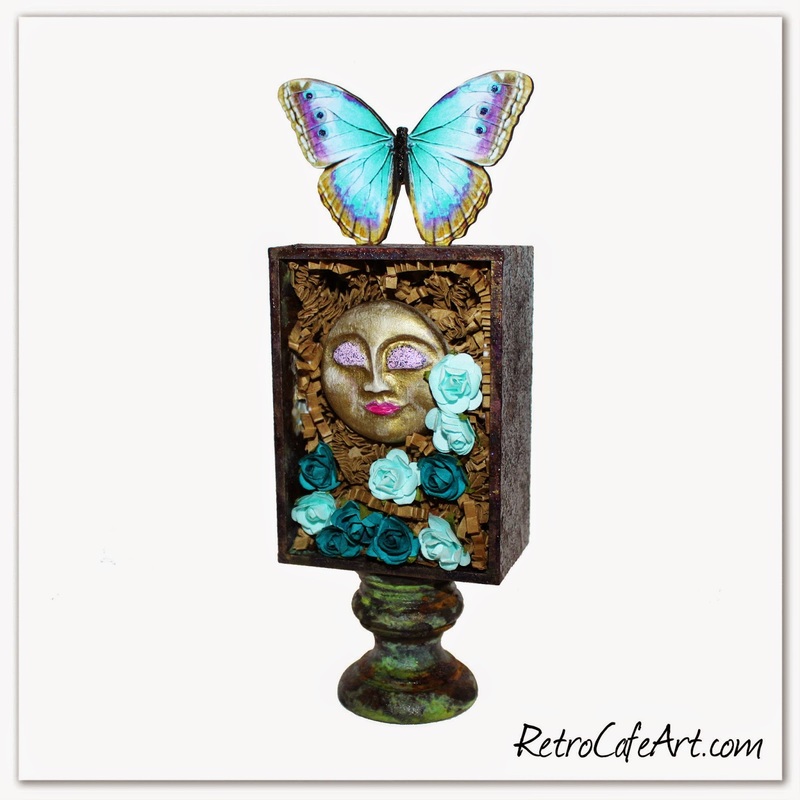 I'm still pushing for Spring over here, and the new Butterfly Shrines are definitely getting me in the mood. I had the idea to design one, and ended up with SIX! You'll want them all! 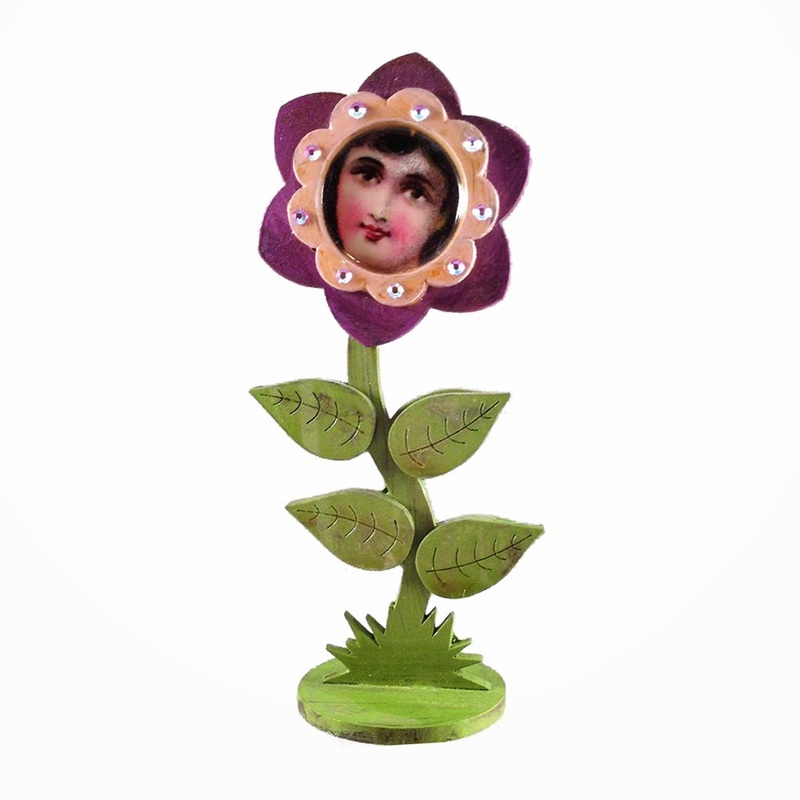 We also have Paper Flowers galore and new Finnabair goodies! Such great stuff! 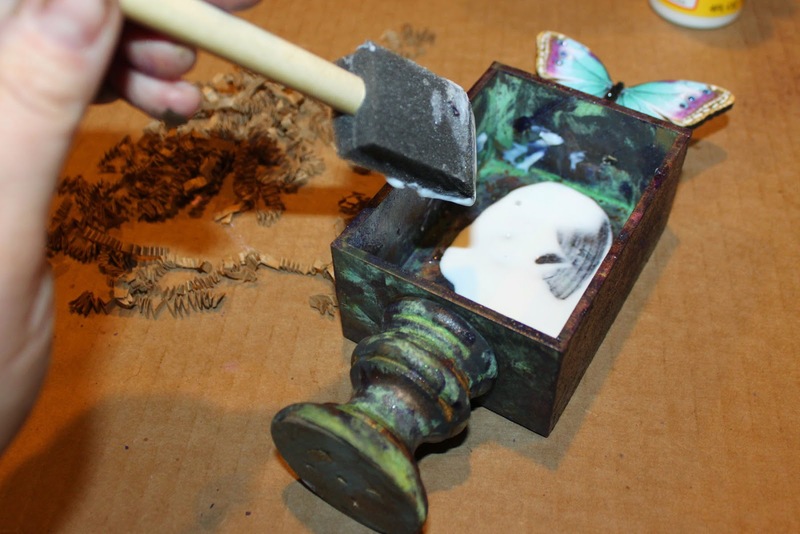 I was excited to play with one of the Butterfly Shrine Kits! It was so hard to pick which one to start with, but the purples and blues were calling to me. I love this color combination! 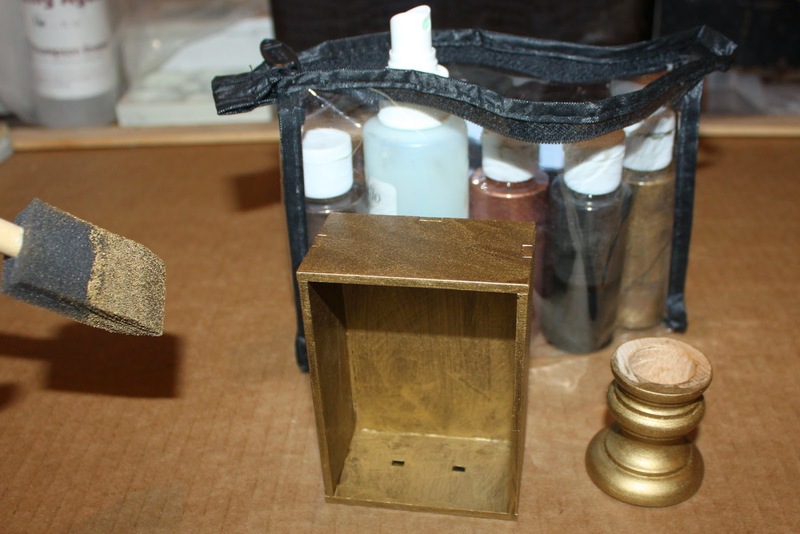 I started by using Verday paints on my assembled box and stand. First a base-coat of gold. 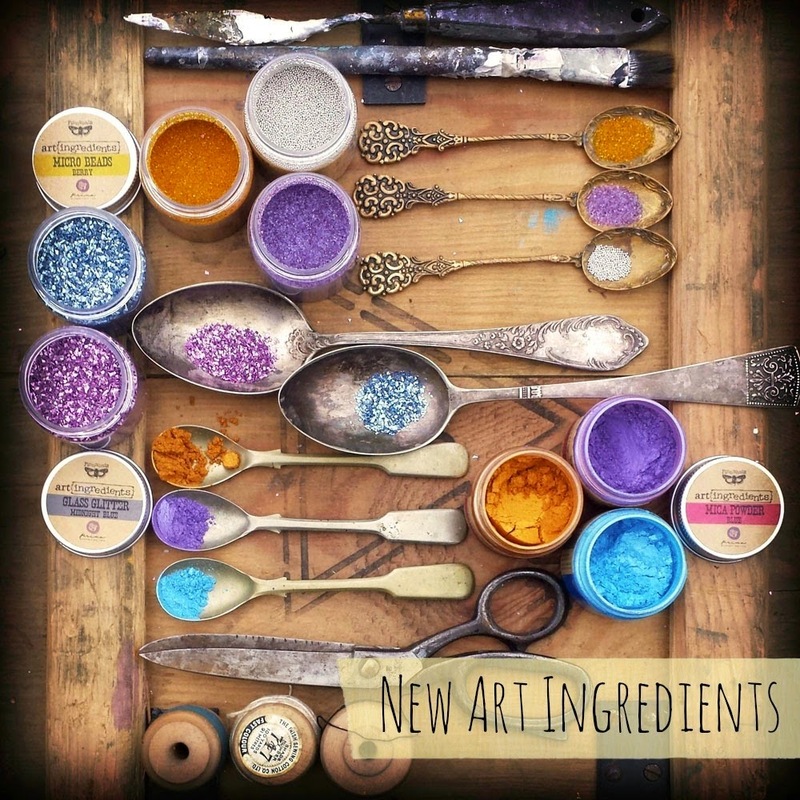 Verday paints can be used in many different ways, with many different combinations. 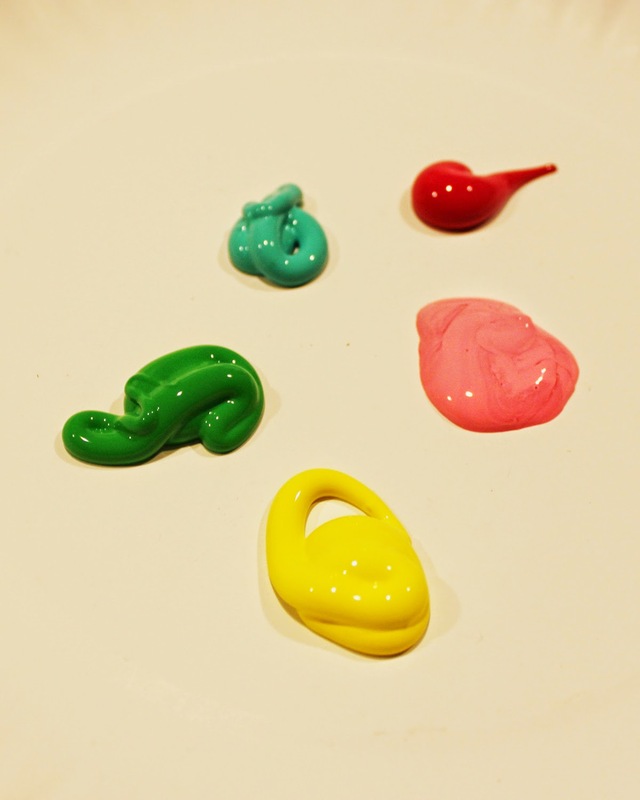 I used all three remaining colors, blobbing them on sporadically. This part is messy, but fun! As my paints were drying, great colors were emerging! 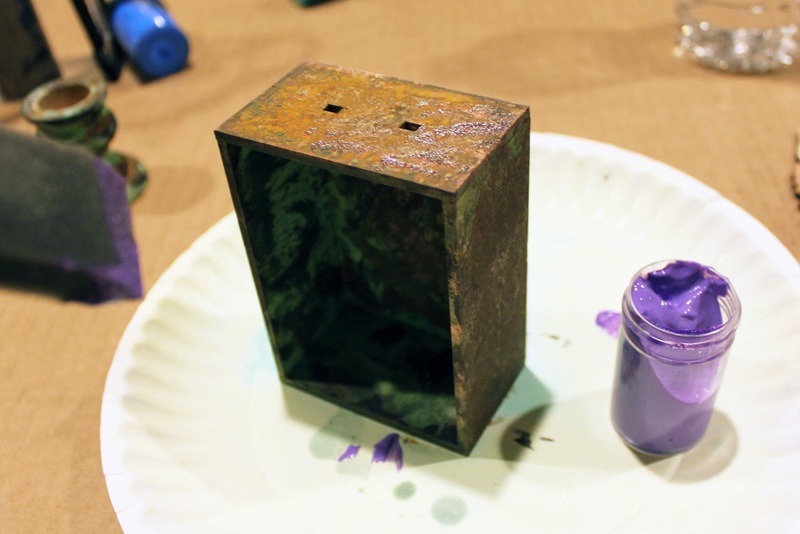 On a whim, I decided to add some purple glitter paint to the mix! 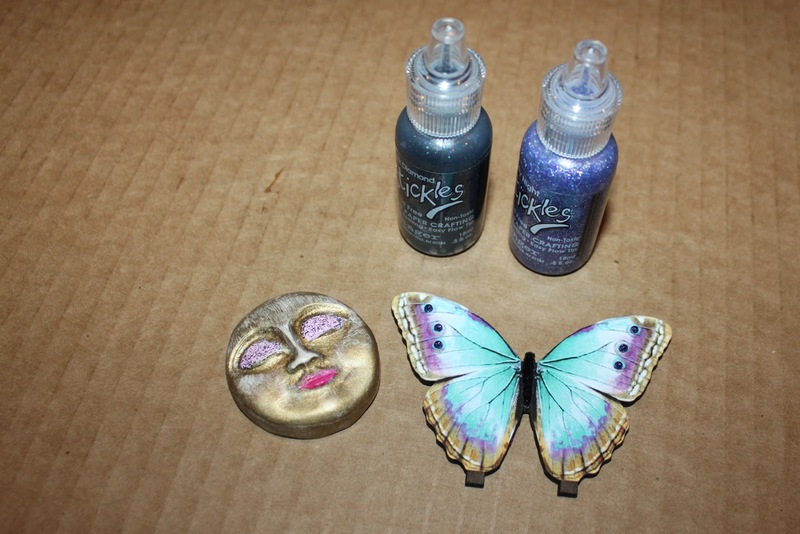 I added some details to my clay face and butterfly with acrylic paint and Stickles. My clay face was left over from my Primitive Angels which you can read about here. 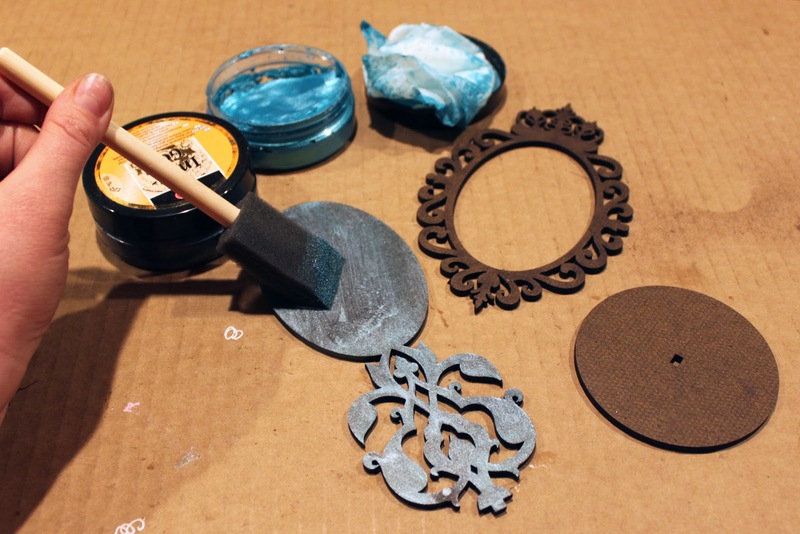 I wanted to fill my shrine with Krinkled Shred, which is a super fun embellishment! I liberally brushed some Mod Podge (my Glue N Seal ran out) around the inside of my shrine. Then I filled it with the shred, pressing it against the edges a bit. 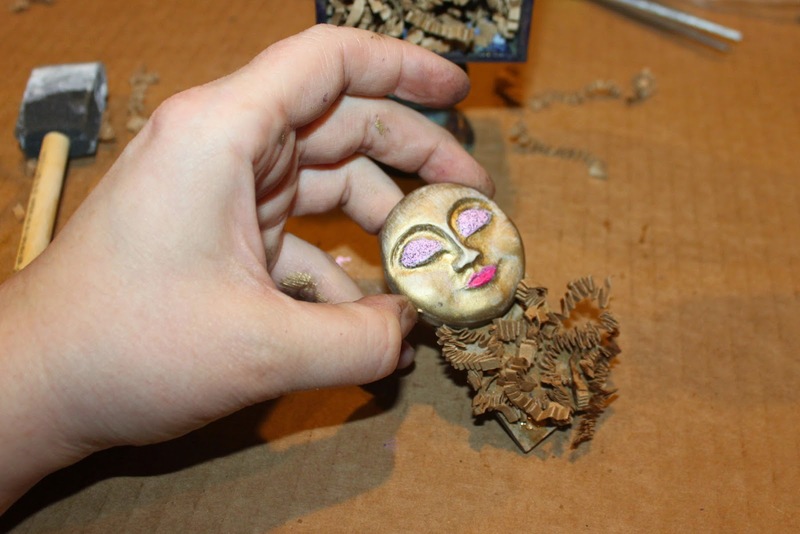 I attached my clay face to a scrap square of Chipboard, and then covered the chip with the Krinkle Shred. Once dry, I glued the bottom of the chip to the bottom of my shrine. It blended right in! 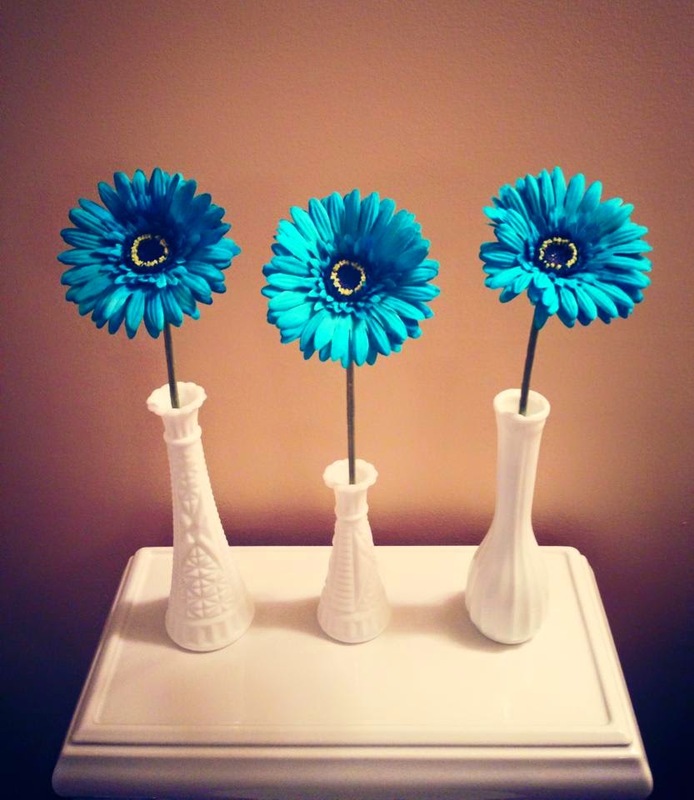 Finally I attached some gorgeous Mini Paper Blooms! Of course the purple glitter I added to the outside is much prettier in person. It came out a bit dark in the photo. I really loved this project! Something a bit different! 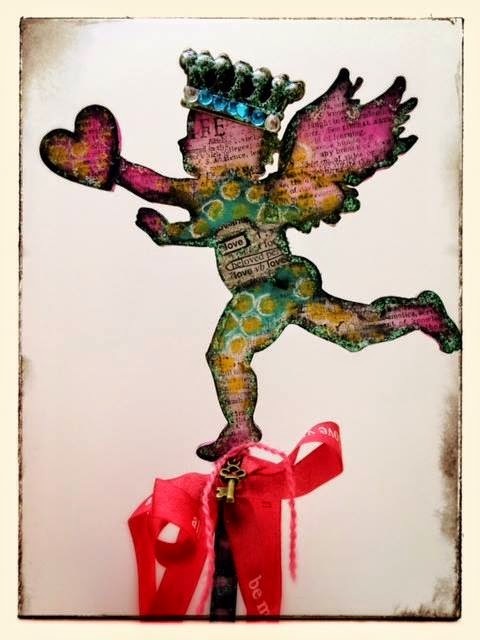 How adorable is this Cupid Stick by Design Team Member Amy Nieman? He or she definitely has my heart. So sweet Amy! 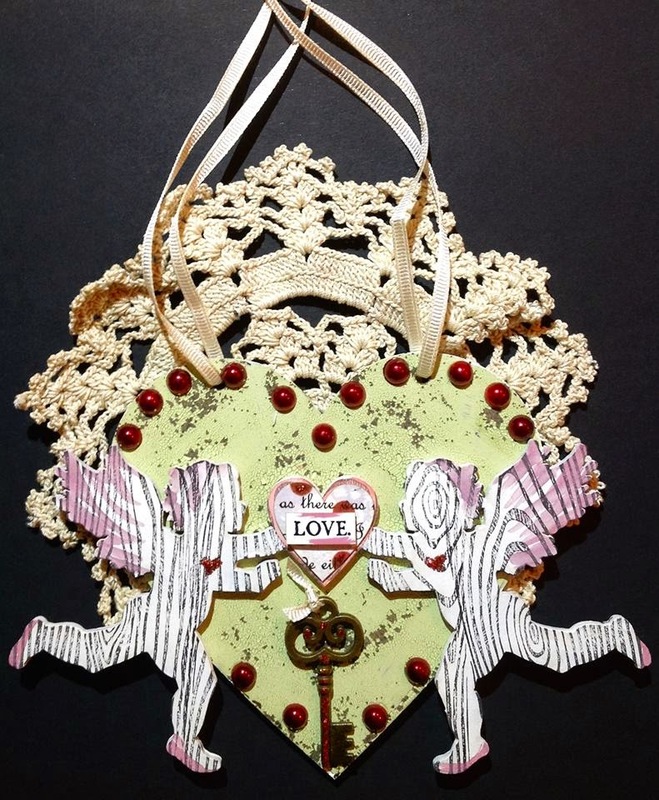 I'm loving this Cupid Ornament by Design Team Member Gerri Herbst! The wood grain stamping is just fantastic! 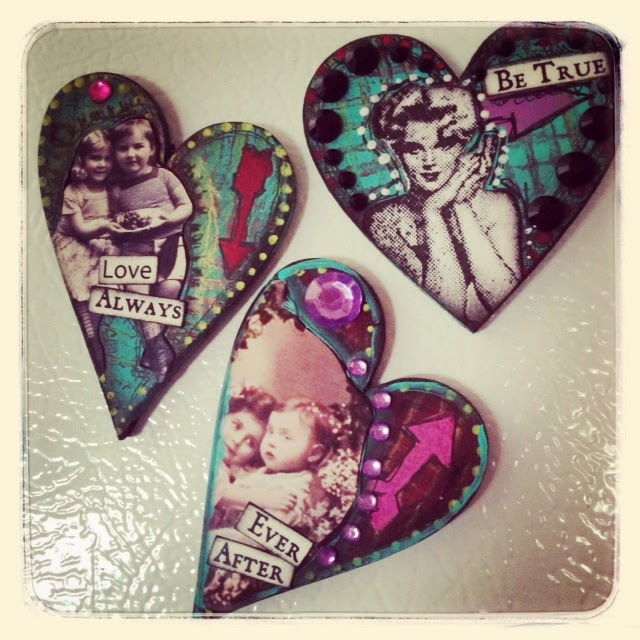 Not to mention the distressed heart! Beautiful Gerri! 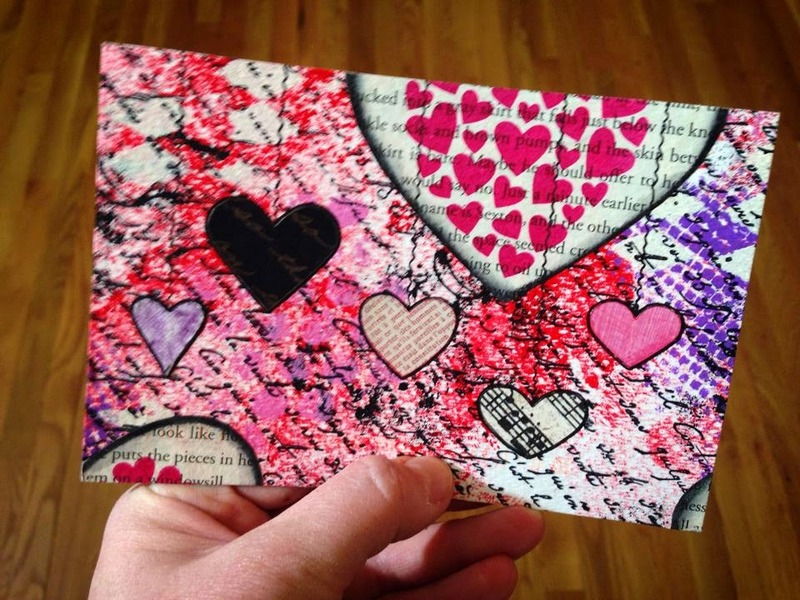 And last but definitely not least, a stunning Valentine's Day card from Design Team Member Lynn Stevens! 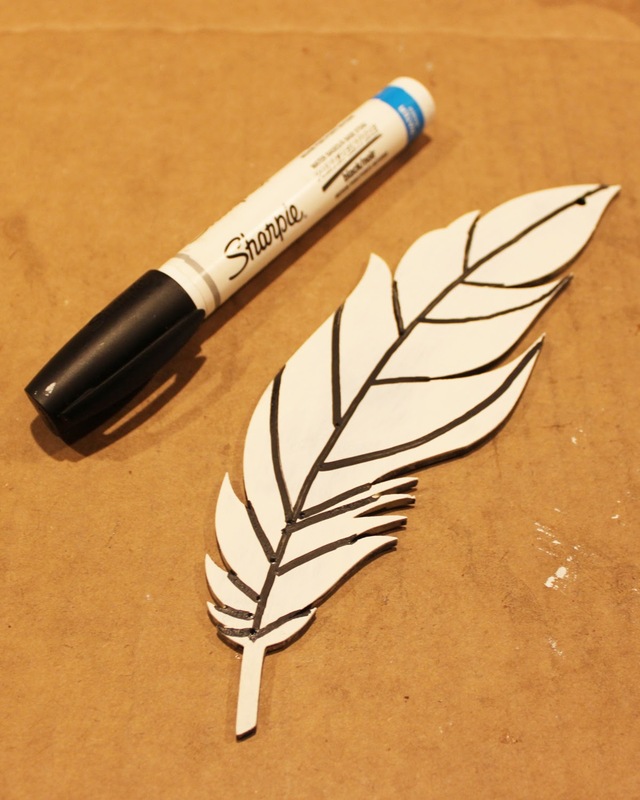 The Heart Paper Cut in the center is the perfect touch! Just lovely Lynn! You are indeed the queen of romantic art! Happy Valentine's Day everyone! 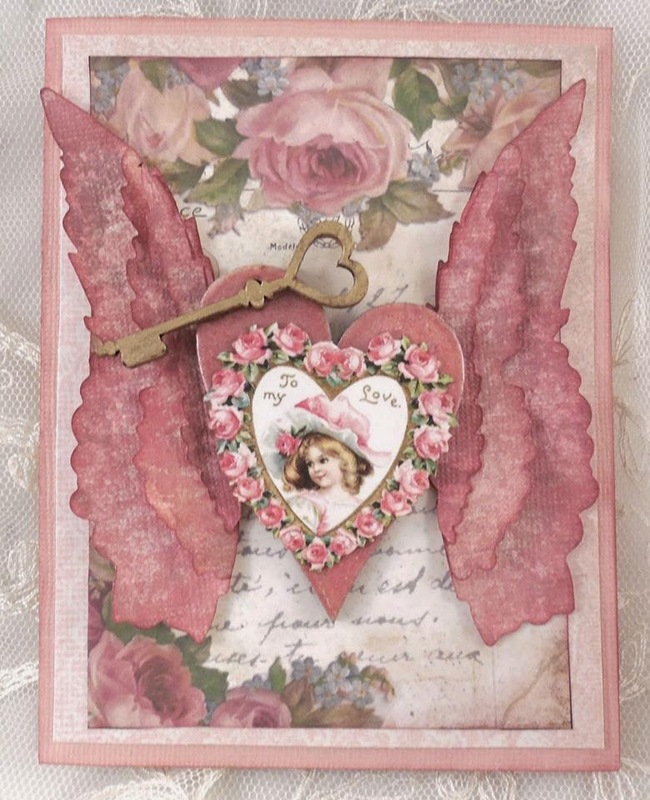 This lovely Valentine postcard arrived for me yesterday by the talented Lynn Britton Radford! So sweet! I hope you get to do something you love tomorrow! Maybe that includes making some art!